A dramatic presentation is guaranteed by this Declined Eyeglass Selection Backlit Display. 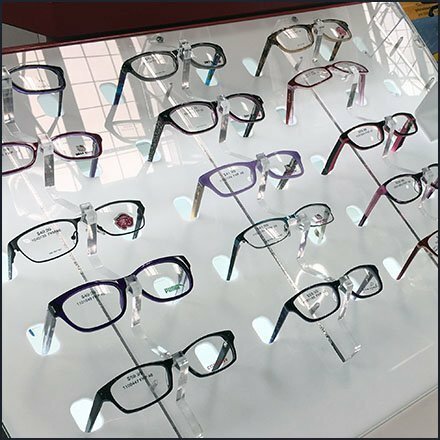 The declined counter-height presentation keeps all frames easily visible without customers having to squat for lowest selections. Multiple declined mirrors allow you to see yourself in the frames with just a glance downward. The glow backlights the frames, while front lighting you for the peek in the mirror. Clear acrylic nosepieces hold each frame in place. This Declined Eyeglass Selection Backlit Display presentation seen at Costco, Allentown.